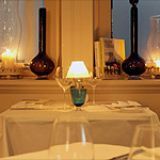 Tartufo restaurant is found on the ground floor of a Victorian building in Chelsea. Head chef Manuel Oliveri oversees the menu of Modern European meals that are complemented by a choice of fine wines managed by sommelier Roberto Della Pietra. Do you work at Tartufo? What did you think of Tartufo? Maybe it’s the Made in Chelsea effect raising the area’s (already considerable) profile but Chelsea has experienced a flurry of recent restaurant openings. Tartufo is the latest and keeps things simple with a modern European theme and a focus on bold, simple flavours. 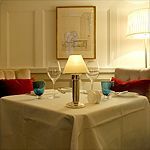 Tartufo sits within the Cadogan Gardens Hotel, easily summed up as: red brick, ostentatious, undeniably beautiful. Inside it’s a little muted with the Chelsea love of all-white luxury but they have at least kicked things up a notch or two with a few decorative flourishes. The two interconnected rooms are filled with quirky prints, pretty china and books of art, complementing the comfortable soft white chairs and tables covered in pristine white tablecloths. It’s not the most original set up for a fancy Chelsea restaurant but it’s very refined. Tartufo is the sort of place you bring a date if you’re out to impress. It feels luxurious, and dining here is more of an event than just grabbing a bite to eat. The staff observe fine dining restaurant etiquette and you certainly won’t be left waiting for service, with several waiters only arms-length away at any one time. There has been a revolution in upmarket London restaurants, moving away from complex menus and confusing pricing. Tartufo epitomises this. 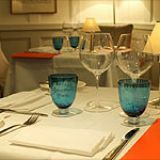 You can choose two courses for £25, three for £30 or four for £40, making it very competitive, especially if only opting for a starter and main course (as many diners seem to do). The menu itself is divided into starters, middle courses, main courses and desserts with just a handful of dishes under each heading. If you’re opting for two courses go for a middle and main course to get the most for your money. To start the spring black truffle with acquerello risotto and demi-sel brown butter is a great example of fantastic premium ingredients. 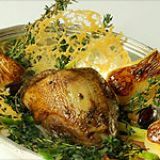 The dish is surprisingly large for a starter and would be too beige if it wasn’t for the slivers of dark-edged truffle with which it is covered. The risotto is creamy and rich and the butter caramalises for an unusual hint of sweetness, but it's a sweetness that unfortunately gives things too much of a rice pudding effect. Luckily, the deep earthiness of the truffle saves the dish from being a glorified dessert. For a main course the choice is well balanced between fish, meat and vegetarian dishes. A real highlight is the short neck of lamb with asparagus, fennel, courgette, thyme and parmesan gratin, and Jersey potatoes. The lamb arrives pre-sliced to show off its pinkness – it’s cooked on the rarer side to allow the tender, fantastic quality meat to shine. 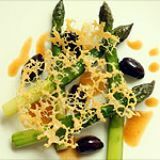 The sweetness of the lamb really shows alongside the light, crunchy asparagus and aniseed flavour of the fennel. The gratin could easily overpower the dish but the kitchen keeps it well-balanced. Jersey potatoes covered in garlic butter and parsley finish off the dish well, and bulks it out nicely. The bar at Tarfuto serves a few classic cocktails but the focus of the offering is the wine. The list is lengthy and ranges from mid-range prices at £20+ up to the very expensive fine wine level. The focus is almost entirely on Old World wine with a skew towards France, which is a shame given the emergence of new wine-producing countries. Small producers like Lebanon and Hungary are largely ignored. Tarfuto is a beautiful restaurant that is embracing the trend for simple menus. It’s just a shame that they don’t push the boundaries very much at all. It’s the ideal new spot for Chelsea, and certainly does what it does well, but for anyone looking for something exciting it might not quite live up to your expectations.